Today, I reached a major milestone for a commitment-phobe. This blog and I had our one year anniversary. It’s been a blast, you guys! Thanks for reading and for keeping the faith. 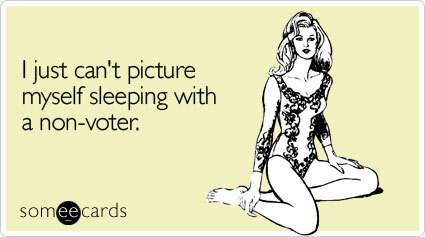 I don’t care which candidate you’re supporting, which California ballots you’re voting for or against, or if you’re pro-choice/pro-life/pro-I don’t know, just make sure you get yourself out to the polls today and exercise your fundamental right as an American because this someecard says it all!